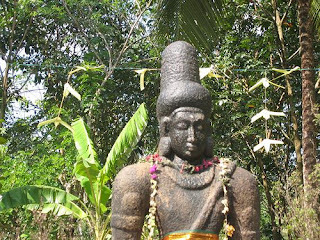 On Sunday 19th June 2011 we had a nice one day retreat at Kodungaloor in Kerala. It was the first one day retreat in Kerala which was fully led by Dhammamitras! The whole retreat was conducted in our mother language, Malayalam, so it was very effective. This retreat was conducted with the help of Kishore Babu, who is a very energetic man. He has strong faith in Dr Ambedkar and Buddhism. He had already attended our five day English residential course led by Ann Dennehy [now Dharmacharini Dayamudra - sadhu!] - through these five days we become strong friends. Kishore Babu collected more than 20 people and they made all the arrangements for the day. The retreat was held at Kodungaloor. Kerala history says that Kodungaloor has a strong legacy of Buddhism. In the past there were lots of Buddhist people living near there, and lots of Buddhist institutions were located at Kodungaloor. Even nowadays people are excavating Buddhist statues and symbols at Kodungaloor! It's more than a six hour journey from my village to the retreat place. Me and Dhammamitra Rejimon arrived there on Saturday morning. On Sunday morning at 9.30 am, Rejimon inaugurated the retreat by lighting candles and we started with Refuges and Precepts and Buddha puja. From 10.00 to 11.00am Rejimon taught anapanasati meditation practice. At 11.15am we had tea and group discussion. From 12.00 to 1.00pm Rejimon gave an introduction to the metta bhavana practice. From 1.00 to 2.00pm we had very delicious food which people had brought from their families, each neighbour bringing an extra lunchbox for those of us who were attending from outside Kodungaloor. After lunch I gave a speech about Dr Ambedkar entitled "Why did Ambedkar embrace Buddhism?". After this we had discussion, lots of questions had arisen. In the evening time we had an energetic cultural program and at 5 o' clock we concluded with the Dhammapalam Gatha ['verses that protect the Truth']. For this one day meditation retreat we made 60 cushions. We are very happy about these assets. We would like to conduct a retreat at Kodungaloor once a month. Likewise throughout Kerala, we are going to conduct one day retreats!